There's no huge secret to staying lean. If you want to keep your body fat on the lower end and showcase your hard-earned muscle, you need to perform cardiovascular exercise or conditioning. Although that's probably not a life-changing piece of information for anyone, knowing you need to condition and actually doing it don't always go hand-in-hand. In other words, unless you have a love affair with your elevated heart rate, conditioning blows. I might not love cardio, but I know it's essential. I design my cardiovascular work much like I design my weightlifting workouts: I keep things interesting, fast-paced, and fun. 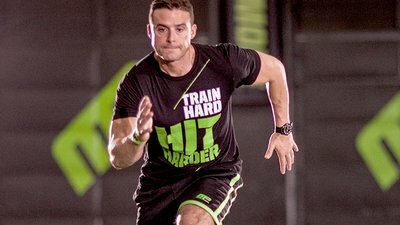 If you try some of my awesome cardio workouts, you won't spend all day on the treadmill. Instead, you'll jump, sprint, and do high-rep exercises so your heart rate goes up and the fat burns off. Here are five fat-torching sessions for you to try. These are pretty intense, so start with one per week. As you become more conditioned, you can do 2-3 per week. The trick to these workouts is to rest as little as possible. Break just long enough to control your heart rate, then go on to the next set!